To Motivate resellers in a sales contest. The Santa Ana, CA-based computer software/hardware distributor figured a chance to ride the famed Orient Express would excite resellers to maximum performance. Entries to the sweepstakes were to be awarded for each sale of the promoted concentrators, routers or hubs. Five thousand resellers were mailed a sound card headlined “Aboard the Orient Express, you can find mystery, intrigue, and suspense.” Flipping to the inside cover produced the wail of a train whistle and an image aboard the parlor car of what could be the recipient if he or she won one of the six prizes trips. 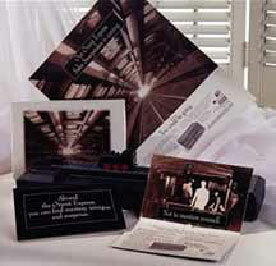 Key accounts were also mailed an “executive stress train.” Designed as a desktop diversion, the promotional gift, with its microchip, recreated the exciting version of the rail excursion prize. Right down to the train whistle, bell and chugging sounds that accompanied a miniature locomotive as it inched its way over a foot-long track. The systems marketing manager attributed a 51.3% increase in quarterly sales to the promotion.